German physician and medical author; born at Ratibor, Prussian Silesia, Jan. 18, 1818; died at Berlin April 11, 1876; elder brother of Moritz Traube. He studied at the gymnasium of his native town and the universities of Breslau, Berlin (M.D. 1841), and Vienna. After a postgraduate course at Vienna University he established himself as a physician in the city of Berlin in 1842. In 1843 he opened a private seminary course on auscultation and percussion, which he continued for a year; in 1844 he commenced his experiments on animals, especially in regard to affections of the lungs through cutting of the nervus vagus, in which experiments he followed the work of Longet. The results of his labors were: "Die Ursachen und die Beschaffenheit Derjenigen Veränderungen, Welche das Lungenparenchym nach Durchschneidung der Nervi Vagi Erleidet" and "Beitrag zur Lehre von den Erstickungserscheinungen am Respirations-Apparat," published in 1846 and 1847 respectively in "Beiträge zur Experimentellen Pathologie." 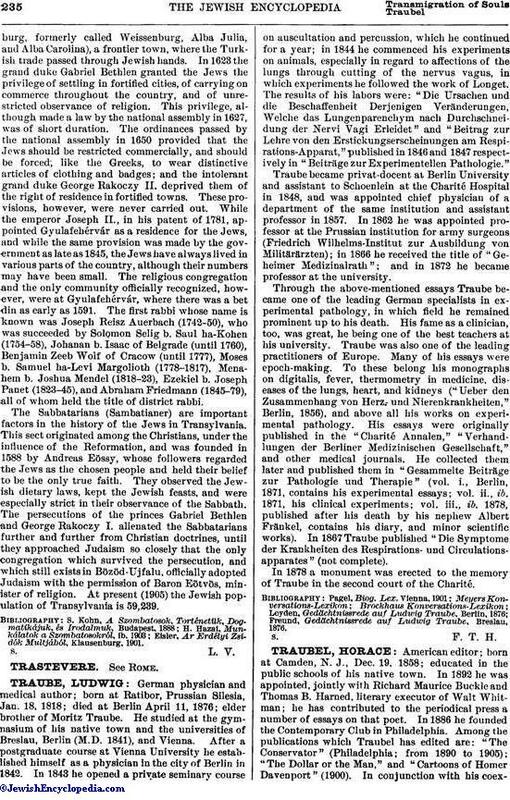 Traube became privat-docent at Berlin University and assistant to Schoenlein at the Charité Hospital in 1848, and was appointed chief physician of a department of the same institution and assistant professor in 1857. In 1862 he was appointed professor at the Prussian institution for army surgeons (Friedrich Wilhelms-Institut zur Ausbildung von Militäräzten); in 1866 he received the title of "Geheimer Medizinalrath"; and in 1872 he became professor at the university. Through the above-mentioned essays Traube became one of the leading German specialists in experimental pathology, in which field he remained prominent up to his death. His fame as a clinician, too, was great, he being one of the best teachers at his university. Traube was also one of the leading practitioners of Europe. Many of his essays were epoch-making. To these belong his monographs on digitalis, fever, thermometry in medicine, diseases of the lungs, heart, and kidneys ("Ueber den Zusammenhang von Herz.- und Nierenkrankheiten," Berlin, 1856), and above all his works on experimental pathology. His essays were originally published in the "Charité Annalen," "Verhandlungen der Berliner Medizinischen Gesellschaft," and other medical journals. He collected them later and published them in "Gesammelte Beiträge zur Pathologie und Therapie" (vol. i., Berlin, 1871, contains his experimental essays; vol. ii., ib. 1871, his clinical experiments; vol. iii., ib. 1878, published after his death by his nephew Albert Fränkel, contains his diary, and minor scientific works). In 1867 Traube published "Die Symptome der Krankheiten des Respirations- und Circulations-apparates" (not complete). In 1878 a monument was erected to the memory of Traube in the second court of the Charité. Freund, Gedächtnissrede auf Ludwig Traube, Breslau, 1876.